Before starting with the lucky patcher you need to know few things about the lucky patcher. →Firstly you should be having a root access to your device for which you need to root your android phone because this lucky pactcher works only with a rooted phone and it is impossible to work without having a root access on your device. 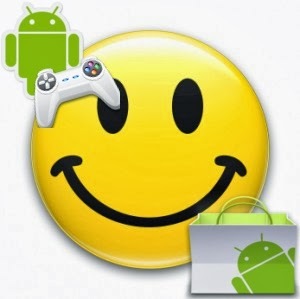 →Lucky patcher is the software which is used to modify .apk files(.apk is the format used for android apps and games). → Its a great software used to change permissions, remove ads and helpful in changing a trail version software into a total full version software with all features as that as on a real full version software by using a custom patch in lucky pacher software. →You can also backup files by using this lucky patcher without using titanium backup as these all are outdated and not in use now a days. At this point, it use only for Applications requiring the correction of libraries ".so". But custom patches do not exist, except for the old Titanium backup, which is no longer in use. →Note:The Patcher need root access to work! Immediately after opening this software it loads all the applications installed in your device and enlists those applications according to the chances of modifying the applications and shows you each application in different colors as listed below. Each colour indicates the different probabilities of changing the applications. Green - This application has a good chance of becoming registered. The exception is the application of two parts (Application and APK-Pro-Key). In such cases, patch both parts, not either one of them. Orange - These are system applications. Be very careful when performing any operations with them, as editing these could do irreversible damage to the application or operating system. BootList - A list of applications that will be patched on boot. At this point, it is useful only for custom patches requiring the correction of ".so" libraries. It will be indicated in the description of those custom patches to add them to the Bootlist. Star - [*] - This means that the dalvik-cache of the application has been edited using Lucky Patcher (ODEX with the changes created), and this in turn means that the application will remain in its current state until the application is updated or deleted. To restore the application to its original, unpatched state, choose "Remove ODEX with Changes" in context menu. If you delete the application using any tool other than Lucky Patcher, an ".odex" file for the application will remain in the folder /data/app/. That will cause the error message saying "Not enough space" to pop up every time you try to reinstall the application. Solving this problem is pretty easy, just launch Lucky Patcher and it will automatically delete leftover ".odex" files. 'Troubleshooting → Remove fixes and backups (to update app)' - all fixes within the dalvik-cache for all applications will be removed. If such ODEX removed with "Remove ODEX with Changes", then the Application will be fully restored to the state before the patch. Note: When you update this application, problems can arise. -Remove License Verification (Auto mode!) - Attempts to remove license check. Uses a small Part of the Templates to ensure maximum stability of the application. If the percentage gotten using this method is low, make sure that the internet connection is present while using the patched app. There are a few differences from "Auto mode!". It may help, if "Auto mode!" did not patch the application successfully. Attempts to completely remove license check. Uses all Templates. The patched application may become unstable, usually instability occurs when the application is offline. Restarting the application over and over, changing or disabling screen orientation may help. Attempts to remove license check using different methods one by one. Use only if auto modes did not patch successfully. Manual mode will scan the application for objects similar to license verification object and show a list of found objects. To use manual mode, first backup using the button at the top of the screen. Next, choose the first object and click the "Patch" button, then launch the application using "Launch" button. If license verification is still present in the app, go back and click "Restore", and move on to the second object. When the object is found and patched and the application is stable, click "Fix changes". You can click "Save as a Custom Patch" to share your patch with others. You should keep in mind, that object numbers change with every application update, and your patch may not work on future versions of the application. Remove License Verification (Selected Patterns) - Applies chosen templates to the application to remove license verification. Disable Ads Activities - Disable different application activities manually. Some activities have a description of what they do. Activities can be enabled back if the application stops working. Support patch for InApp and LVL emulation - Adds support for InApp emulation to the application. InApp emulation can be switched on in Toggles menu. Disable Components 'pm disable' method - Removes chosen permissions, services, activities, etc. This ability is built into Android, and therefore is not harmful. The only thing that can stop working is the modified application, which can easily be fixed by enabling back permissions. Change Permissions (unstable method) - Removes permissions of the application (edits system file packages.xml). Be very careful while doing this. On some devices, this method can lead to a circular reboot or other undesirable consequences. Make a backup of the system before you try to disable permissions. Change Permissions and Activities (safe method) - Removes chosen permissions by rebuilding the APK with changes. This method does not change the application signature. This only works on system applications, or on all apps if "Disable .apk Signature Verification" patch is applied to Android. Change Permissions and Activities Rebuild and Install - Similar to safe method, except this method uses new signature and does not keep the original signature. The application may not work correct using this method if it checks the signature. Create Modified APK - Creates an installation package APK with the preapplied patches. You should keep in mind, that rebuilt application may not work the same way as an application that has been patched through the patcher. This issue is present because an application can "check" itself to find any changes in the code and signature. Remove ODEX with Changes - Removes ODEX file containing the changes. Thus, restoring the application to its original status. Remove selected saved purchases - Remove purchases saved through Google Billing Emulation. Restore - Restore application from an APK file in /sdcard/LuckyPatcher/Backup/. Backup - Backup APK file to restore later. APK file is saved to /sdcard/LuckyPatcher/Backup/ folder. Patch on Reboot - This setting is not relevant anymore, because on new versions of Lucky Patcher, all of the changes are saved to an ODEX file of the application, which does not change on reboot. This setting can only be useful if a custom patch changes ".so" libraries of the application, which will be indicated in the description of the patch. Manual Patcher - Patches chosen files according to inputted template. Useful for debugging the application. ODEX This Application - Create an unchanged ODEX file of the application. Move to /system/app - Converts the user application to system application. Share this App - Creates a backup APK file of the selected application and shares it though any app. Copy Changes to dalvik-cache - In the default mode, all changes remain in the ODEX file. Copying to the dalvik-cache can help when ODEX files do not not work for the application (for example, when an application is moved to an SD card). However, you will need to reinstall the application to restore it. Backup APK file for reinstall - Copy APK file to SD card in the Data Folder of Lucky Patcher. You can reinstall (to restore) the application from this APK. Delete dalvik-cache - After creating the ODEX file, dalvik-cache of the application is deleted to save space. If the application does not work with ODEX, you will have to reinstall the application. - To return the application to its original state, you will need to tap "Remove ODEX with Changes" or "Restore". - To return the application to its original state, you need to tap "Remove ODEX with Changes" or "Restore". - You must tap Apply (Reboot). - You should know that a rebuild APK file is not the same as the patch is already installed application. Since the as opposed to simply patch the application is very easy to test yourself to changes, and thus work correctly so fail The install will not. Note: Lucky Patcher closes an application when it applies a patch to it. This is necessary so that the new changes will persist. However, sometimes you may also need to restart the device itself or use a third-party tool to kill the process or processes of the affected application to see the changes. tags: lucky patcher tutorial, lucky patcher help, How to use lucky patcher without root access, how to use lucky patcher without root access for in app purchases, lucky patcher no root access found fix, lucky patcher tricks, lucky patcher ads block, lucky patcher patch list, lucky patcher play store trick, lucky patcher original. How do you patch DraStic DS emulator using this lucky patcher? Can I play games offline using lucky patcher? Now, I am trying to add google account then it says "there was a problem communicating with google servers"
and account is not created. 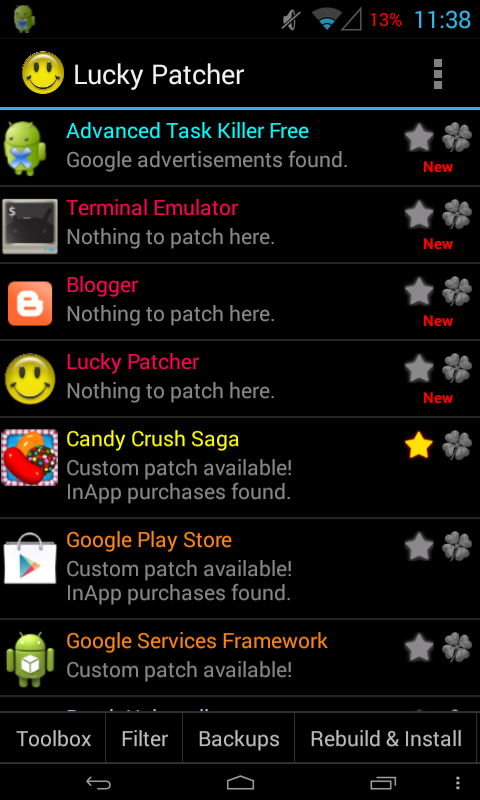 Lucky Patcher latest version and moved to toolbox tab but i did not get option like Patch to android. Please suggest what should be the next course of actions? I wanna know that how can I remove a application which was made system app by lucky patcher?? for removing.... ur phone must be rooted and if u hve rooted ur phone with kingoroot thn just use superuser installed application whivh automatically installed after rooting ur phone...and from there u can remove the system app thn reboot ur phone..tht's it..